The peacocks are peowwwwing at dawn. The pigeons sneak sips in the enormous fountain of water in the middle of the patio at Rambagh Palace in Jaipur, India. 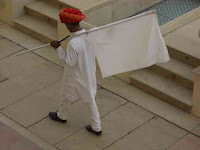 Two Rajastha men wrapped in white pajamas (Punjab style) with bright red turbans twirled on their head carry large white flags and a stick. They roam the enormous patio-garden (called chowks) beating the flags periodically with the stick because it sounds like a shot-gun. Their job is to shoo away the pigeons over and over, those persistent birds only going up to another levered edge of the palace t emporarily. This is pigeon city. Balconies, yards, streets are filled with them. At one sidewalk strip where vendors sell grain and corn, my driver points it out as the pigeon restaurant. Behind the open booths, thousands of pigeons partake of corn kernels scattered hopelessly across the ground. The contrast of life in Jaipur - home of many castles, palaces and enormous forts built buy Rajasthan warriors and extremely wealthy Maharajas (where bankers, merchants and jewelers thrive) while the streets are overdosed with cheap hovels for shops, beggars and pickpockets - doesn’t lessen the i mpact of a city where almost all the buildings are pink - sort of a brick pink in most cases but with elaborate trim in a custard color and elaborate old buildings with balconies and fancy window treatment. 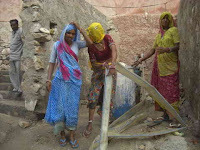 Primarily, it is suffocatingly hot but women still go about in bright colored saris whether the y are working in construction, doing marketing, or begging from tourists. You don’t see the regal class on the streets ever. You guess they are here by the appeal of their palaces - one floating in a huge lake - but no Rolls Royces plie the streets. This was another thrill day for me. At Amber Fort, which was built high on a mountain and is surrounded by what locals consider a Great Wall of China kind of wall that extends for miles, tourists can ride elephants. Sigh. I got the urge again but this time I wanted to find a painted elephant. No problem. 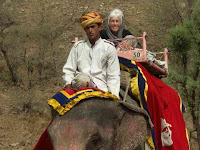 All the elephants were decked out in royal robes (long saddle blankets) and pink metal boxes for riders. Their faces were made up with colorful flowers. They lethargically swung their trunks, not at all interested in this kind of tedious work and had to be shouted at to ge t them to get close to the mounting tower. Today their task was to carry customers down a paved road alongside a construction area in the fort. 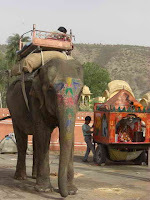 When strong dust storms approached, the elephant riding was over. I got my 20 minutes in and before we had done a turn around, my driver, who may have thought he was auditioning for Ballywood as he sang cheerful songs and waved to the workers on the road as we went, was quizzing me about a tip. 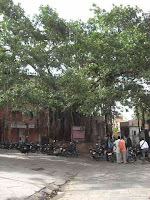 Jaipur is the first city where tips were negotiated. And watch out for the photographers who charge five dollars a shot. 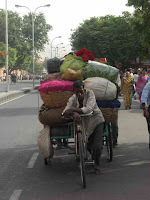 They are printed out on pretty good paper and are pretty good photos, but lots in Jaipur is overpriced. 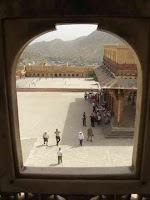 A vis it to the palace in the fort area was at least healthy exercise, i.e. steps and inclines. 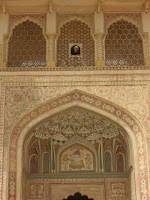 In most palaces and on some street-side structures, the Maharajas were considerate of women, who were not allowed outside the palace confines. 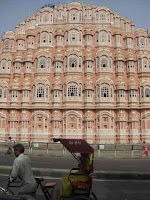 They built high, elaborate facades called Hawa Mahal with whimsical facades and one or three tiny windows that would expose nothing about the women, but where they could, mostly concealed, sit and watch the Maharaja or dignitaries arrive in to the city and any other celebration or bazaar activi ties going on below. This practice of keeping women hidden from all men except a husband was called Purdah. There were even chess boards for ladies but none of the pieces were of kings or queens or even horses. They were different sized little mushrooms, so it seemed. The 18th century was a major macho era, maybe still is. I can’t find any Maharanis or Maharajas in house, just pictures of them in coffee table books. Returning to the city, there was a camel stand. Yes, here camels and elephants add noise and congestion to all the motorcycles, bicycles and rickshaws that hog the road. 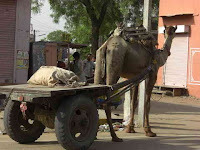 Camels, their tall lanky bodies standing up above the crowd, pull carts o f wares. Elephants carry workers and often giant loads of grass. But at the camel stand, I yelled, Pull Over. I want to ride the camel. There were about a half dozen, gaily decorated with red and gold things hanging from their bridles, and blankets ranging from a printed one to one glittered with spangles. A little boy was the driver of the sweet faced camel I chose. Th e beast got on her knees and I easily mounted the saddle with stirrups which was hidden under a red throw. Hold on, the boy said. Then there was an extreme movement as the camel rose on her fore-feet and then her back feet, me trying to balance as she did, and we were off. What a pleasant gai t this camel had. However, the kid was leading us wrong way down the busy highway, every kind of vehicle whizzing past us and beeping horns. Yikes. I yelled, couldn’t we walk on the side of the road and not the middle? The boy was oblivious, and very prideful because he had a customer. A man who said his name was Tony kept taking photographs and yelling I will bring them to your hotel. Heck, I wasn’t giving out the hotel name since is was the luxury palace. But my driver made arrangements so I could see the photos later. The camel ride was a hoot and I hated that it was over, but the dust and heat was excruciating, even though I had wrapped my head in a thin scarf Indian lady style. This impressed the photographer. 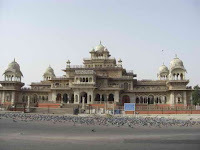 A trip to the City Palace which has a partial museum of Maharaja clothing and Diwali dresswas also fascinating. Most of the fabrics were embroidered with gold and silver threads, in thick brocades and one outfit for a 19th century male, white muslin, had three hundred and fifty pleats called kalis or pamels - for a man. But most interesting was the polo uniforms from the wardrobe of Maharaja Sawai Man Sing II, famous for his polo and billiards. Here I learned about the "fiery ball" or night polo when a candle was secured in a metal ball that looked very Muslim in design, called a ‘palas’ and somehow it was playable in the dark although you’d need one hard hitting polo mallet. This was a 16th century delight of the warrior Akbar whose polo mallets w ere decorated in gold and silver, and if one broke, and another player was able to pick up the pieces, it was finders keepers. Women, who were not allowed to sh ow their faces in the daytime, often would play polo in the dark as well. 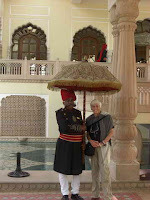 The early uniforms were thick, heavily embroidered jackets and trousers, but later the jodphur was created for polo, and now even hotel employees wear them. At the end of the day, another curiosity was answered. A young lady painted my hands with henna, a h abit women in Jaipur are known for especially when they dress up for fiestas and balls. Of course I was just going to have dinner and Indian sweets in my room. But it was the know how I was after. It is a tedious job for the artist, who must have a patience beyond Job. 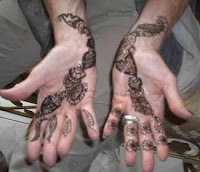 Once the black henna dries on your hands - you cannot wash them for a couple of hours - you rub it off and what is left is a beautiful brownish design. I found some henna and hope to show my college-sorority granddaughter how to do it since she’s the artist in my family and it might make a fun fad at her university. Photos: Pidgeon swatter at Ramburg Palace; Pink Palace at city gates with pigeons; At the hoteol, lux shade; Women in construction; a load on the road; the bomb site; a camel cart; Hawa Mahal, a pink hideout for females; Should we take this lady? 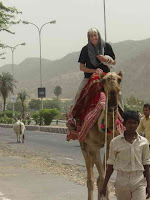 Riding the camel India style, ie, with scarf on head; Hawa at City Palace - that's me up there; What I saw; New Henna being app-lied; Henna done - it's red.